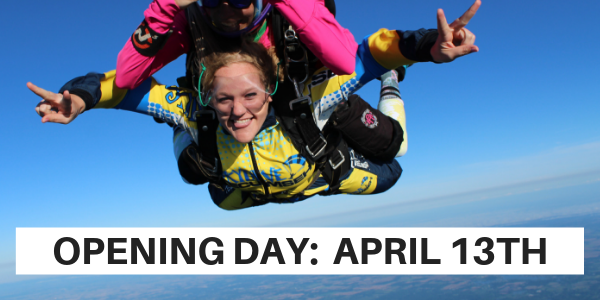 Ready to take flight with a tandem skydive? We hope so! Though, if the temperature is feeling frosty, you might be better off waiting. 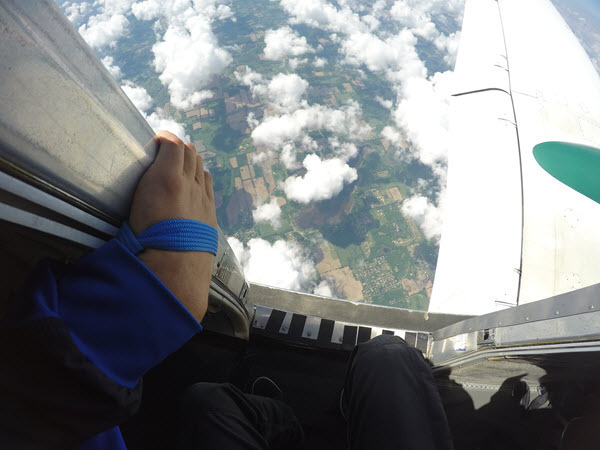 At Skydive Tecumseh, we believe in making our guests first experience a great one. Because of the frigid winter temperatures, for the safety of our jumpers and our aircraft, we are open for jump operations from April-November. Though, cold weather doesn’t have to be a show stopper for would be skydivers. If you’re skydiving in winter weather, a brisk day in the beginning of spring, or the crisp late days of autumn, with our top tips for skydiving in winter there is nothing to stop you! Skydiving in these chilly temperatures just requires a bit of preparation. Before you dive headfirst into skydiving in winter weather, to make your choice consider the average temperatures in the different seasons. *A range is given because of the steep difference in temperatures from one month to the next. Still feeling tough? Take in to consideration that the temperature at altitude is usually quite a bit below the ground temperature. Just how low? The temperature drops around 3 degrees for every thousand feet of elevation you gain. Imagine a winter scenario, if it is 30 degrees on the ground, you’re looking at SUBZERO temperatures at 14,000 feet. Trust us, skydiving below freezing is no fun. But, the brisk feel of freefall is just about the most perfect way we can imagine to beat the heat of a hot summer day. Still, if you’ve got a real hankering for a chilly adventure, here’s how you can best be prepared. It all starts with knowing what to wear skydiving. Regardless of which you think is your “better” half, you’re best off if you keep both warm! When you’re wondering what to wear skydiving in winter, base layers on the top and bottom are a must. But even amongst base layers there are differences. Make your choice considering the material, the weight, and the fit. You won’t want to be drenched in sweat right before you hit the chill of the air at altitude, so choose a base layer that is made of a material that wicks well. Additionally, to maximize the usefulness of a wicking fabric, it has to be in direct contact with your skin. So, for your base layer, aim for items with a snug, but comfortable, fit. Finally, consider the weight of the fabric. Typically, your options are lightweight, midweight, or heavyweight. The “heavier” weights are ideal for very cold temperatures while still minimizing bulk. Finish off your attire with a fleece on top and a pair of bottoms you can move around in. Phalanges= Fingers and Toes! When people beginning planning what to wear skydiving, they often forget about some very important parts: their fingers and toes! And those fingers and toes of yours don’t want to be forgotten. These little bits of you are quite distant from the warmth of your core. Unfortunately, this makes them prime targets for the brunt of the frost bite if you don’t protect them. We suggest wearing your favorite pair of thick socks to keep your toes toasty, and while we provide gloves when it is cool out, it definitely helps to double up with your favorite pair of glove liners. Thin wind resistant layers are great, but nothing can compare to this finishing touch. If the temperatures seem like your skydiving in winter, make sure you say yes to the jumpsuit. Sure, to you it may not seem like the most fashionable item of all time, and you might not see it being strutted across any runway. But, trust us. Even the most appropriate clothing you can bring can’t hold a candle to the specialized wind resistant nature of a jump suit. The thousands upon thousands of skydivers that don a jumpsuit when they skydive can’t all be wrong. After all, our jump suits are specifically made with skydiving in mind, so they are a great deal sturdier than your single sweater. There you have it! The top tips for skydiving in winter. We’ve got an idea. Why don’t you put all this knowledge to good use and book your skydive at Skydive Tecumseh today?